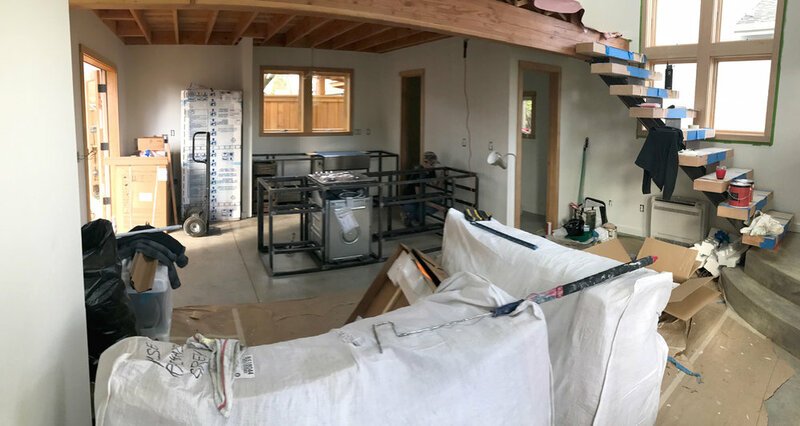 while we got our start crafting small spaces and ADUs, we have a passion for remodels that allow us to craft a new fresh look within the existing framework of older homes. This turn of the century home had several remodels over the years, clearly with a focus on adding space for a growing family but ignoring open space, lighting and flow. The house also sits on SE Division St, and the rapidly increasing density is apparent given the 4 story condo building that now sits next door. 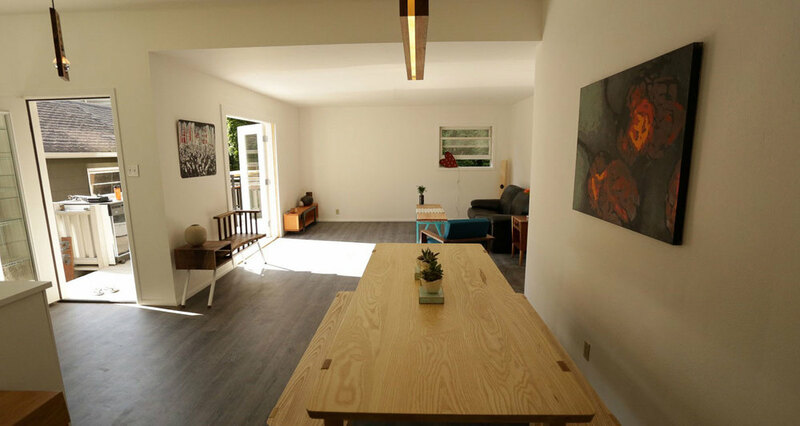 The living space was a combination of a long unusable living room that sat in the dark shadow of the condo building and a kitchen and dining room that were divided into almost unusable small boxes that prevented natural light or traffic flow through the house. Our response was to “flip” the entire plan over to refocus the living spaces on the back yard and garden and to capture to sunlight from the east side of the house into those areas. We ripped out interior walls to form an open and bright living space and moved the bedrooms to the part of the house more suitable for a restful nights sleep. The result is an exterior that is clearly still an old portland home but an interior that feels as bright, open and comfortable as modern construction. Our clients approached us looking to transform a closed off and dark home into a light filled open floor plan beauty. Our design slices the home into two halves with a glass corridor that runs the length of the home from front door to back. 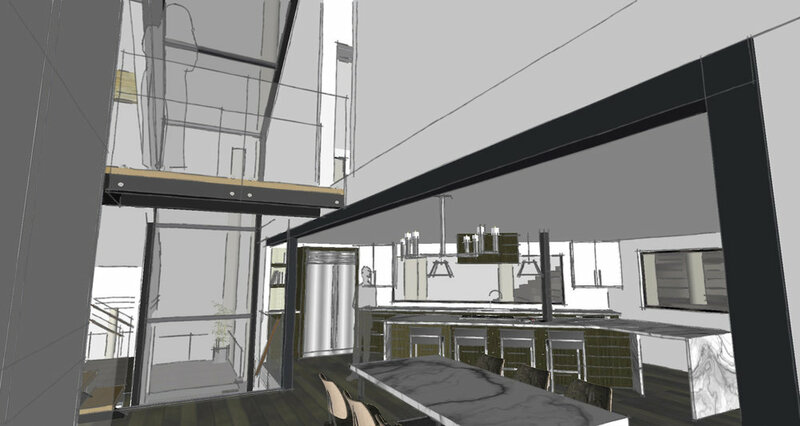 The walls separating the kitchen, living and dining rooms will be removed to allow for an open plan and great room. 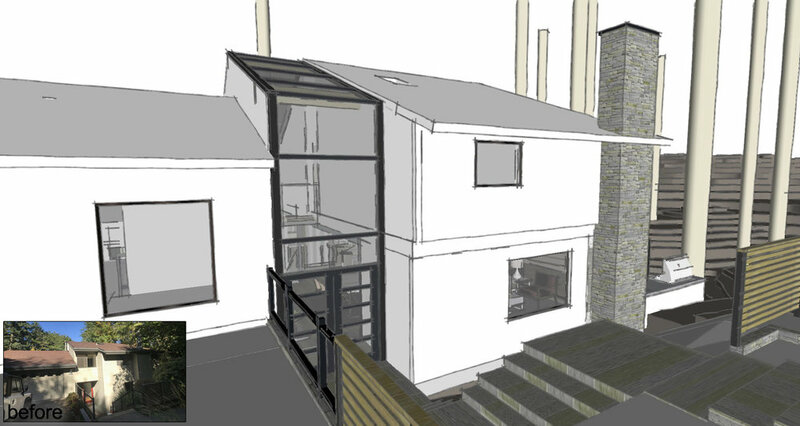 The stairs will be reoriented and glass railings will ensure the open feel of the home remains and a connection between floors can be created. The result takes advantage of the tall ceilings and allows natural light to pour into the home through ample windows and accordion wall systems that remove barriers between indoors and out and allow the homeowner and guests to take advantage of the forested site surrounding the home. 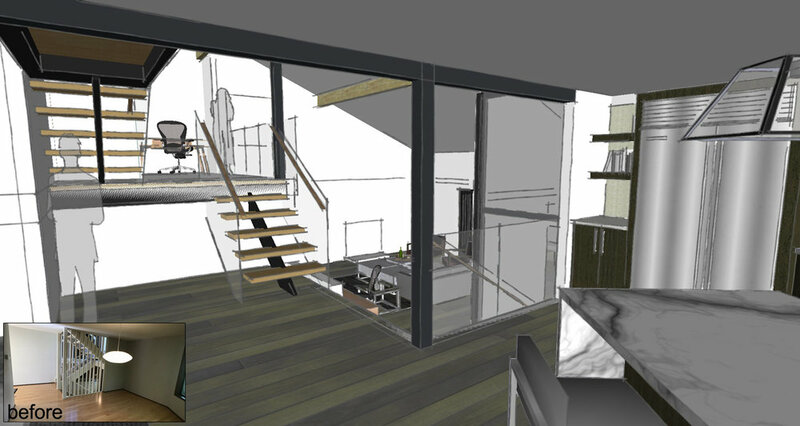 Our client approached us looking for help to envision the interior of her new small home. We worked with her to design a modern industrial interior that will provide an affordable yet flexible space that allows her to live much larger than the square footage of her new small home would typically allow. Steel framed cabinets with inset fir sit inside the exposed structure of the kitchen ceiling and theisland bar can be rolled out as a standing workstation during the day or for entertaining/dining in the evening. Our clients have the privilege of in living in an old church. The problem was trying to make that old church converted into a home also look sleek and modern. 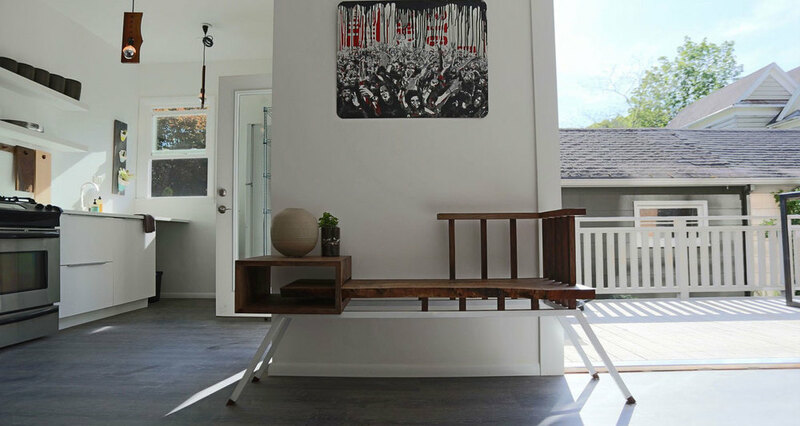 They hired us to help them re-imagine the paint scheme, approach and entry to their new home and add a new set of materials that can be incorporated both inside and out. We started with a combination of Ipe, which will weather naturally to an beautiful (and no-maintenance) grey and then added some raw steel plates and powdercoated steel structures. We occasionally get hired to do a quick set of conceptual renderings to envision what a house could look like after a remodel. In this case, we took a home that was for sale and gave it the "zenbox treatment" to help the potential investor gauge the magnitude of the project and eventual sale price/value.